This post highlights changes and additions related to Android app processing that shipped with JEB 2.3.5 (and the upcoming 2.3.6 release). Per usual, consult the full changelog for a complete list of changes. We added plugin support for unit contributions. These back-end extensions can be written in Python! Practically, contributions for text documents (eg, disassembly) take the form of pop-ups when the user hovers the mouse over a text item. 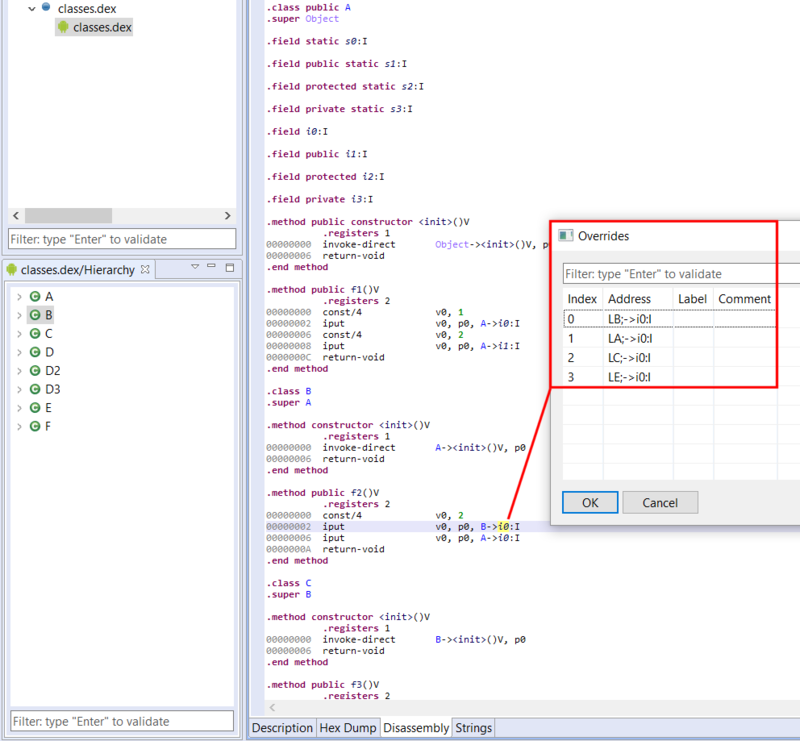 Several JEB modules already ship with contributions, eg the Live Registers view of the jdb/gdb/lldb debbuggers plugins. 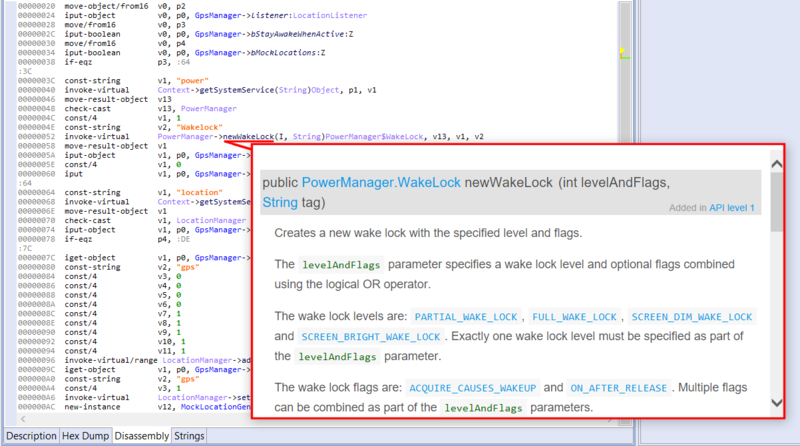 The javadoc contribution kicks-in when hovering on a type name or method name, here, newWakeLock(). The DEX disassembly view now starts with a comment header summarizing the principal features of the bytecode, and optionally, its containing application (APK) unit. Basic information is identified, such as package names, application details (if there is one1), activities and other end-point classes, as well as dangerous permission groups. Various APK and DEX features of a known Android malware; notice that some phone and text permissions are requested by the app. 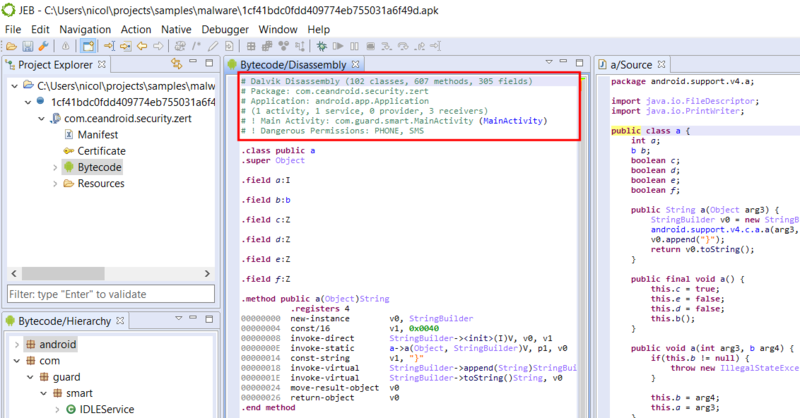 This legitimate APK is not an application, and the disassembly header emphasizes this fact. Up until JEB 2.3.4, renaming fields and methods only renamed the directly accessed field/method reference. We now support renaming “related” references as well, to cover cases like method overrides or “out-of-class” field access. Technically, accessing x in (1) is not the same as in (2): f() uses a reference to A; g() uses a reference to B. However, the same concrete field is being accessed — because B is not defining (masking in this case) its own field named x. Even if B were to define its own field x (of type int or else), we could still access A.x by casting thisto B. Similar issues arise with methods, with the added complexity of interface definitions and overrides. JEB now handles renaming those references properly. Also remember that viewing the list of cross-references (key: X) does not display related references. You can see those by executing the Overrides action (key: O). Various accesses to field A.i0 (here accessing it via type B) can be seen by using the O key. The O key also works for method references. IDexUnit and IDexFile: those interfaces have been present since day 1 or almost; we added a few convenience routines such as getDisassembly(). Remember that IDexUnit represents an entire DEX unit, possibly the result of an underlying merger of several DEX files, if the app in question is a multi-DEX one. If you need to access physical details of a given classesX.dex, use the corresponding IDexFile object, which can be retrieved via the master IDexUnit. IApkUnit: also a well-known interface; several convenience methods were added to access common Android Manifest properties, such as activities, services, providers, receivers, etc. Obviously, you may access the Manifest directly (it is an IXmlUnit) and perform your own XML navigation. IXApkUnit: this new interface represents Extended APK (XAPK) files and is self-explanatory. ICertificateUnit: the certificate unit is also self-explanatory. It offers a direct reference to a parsed X509 certificate object.